A school has been closed after police were called following reports of the sudden death of a man. 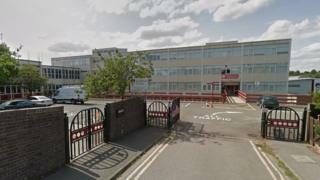 Northamptonshire Police confirmed officers were called at 20:48 GMT to Southfield School, Kettering. The secondary school said on its website that "due to an incident" on Monday night it will be closed on Tuesday, but would reopen on Wednesday. "We appreciate that this is short notice and apologise, in advance, for any inconvenience caused," it said. In a later statement, the school confirmed that a member of its support staff had died. "At this stage we are unable to release any further details out of respect for the family," it added. The East Midlands Ambulance Service said it was called at 20:01 to a report that a person had collapsed. A spokeswoman said an ambulance car, a fast response car, the air ambulance and a crewed ambulance all attended. Due to an incident, school will be closed today - Tue 26 Mar. It will be open again on Wed 27. Appreciate the short notice and apologise for inconvenience. On Twitter the school said the Bronze Duke of Edinburgh's Award training walk would be rescheduled. The Year Six uniform try-on event, will go ahead on Tuesday evening as planned.